Classified communications satellite, perhaps providing services for the CIA to replace channels hosted on the US Navy's UHF Follow-On series. Stationed in geostationary orbit at 34 deg E.
Status: Operational 2009. First Launch: 2009-09-08. Last Launch: 2009-09-08. Number: 1 . Family: Communications. Country: USA. Launch Vehicles: Atlas V, Atlas V 401. Launch Sites: Cape Canaveral LC41. Bibliography: 12942. 2009 September 8 - . 21:35 GMT - . Launch Site: Cape Canaveral. Launch Complex: Cape Canaveral LC41. Launch Pad: SLC41. LV Family: Atlas V. Launch Vehicle: Atlas V 401. USA 207 - . Payload: PAN. Nation: USA. Agency: Martin. Class: Communications. Type: Military communications satellite. Spacecraft: PAN. USAF Sat Cat: 35815 . COSPAR: 2009-047A. 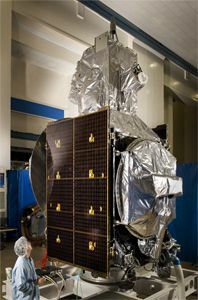 Apogee: 35,800 km (22,200 mi). Perigee: 35,800 km (22,200 mi). Inclination: 0.00 deg. Period: 1,440.00 min. Classified communications satellite, perhaps providing services for the CIA to replace channels hosted on the US Navy's UHF Follow-On series. Stationed in geostationary orbit at 34 deg E..